If you’re looking for a romantic wedding venue steeped in Borders history, Barony Castle is perfect. This striking romantic 16th century Scottish towerhouse is set in beautiful grounds near the pretty Borders town of Peebles. It’s now a stylish, modern and very comfortable hotel, well known locally for its fine dining and decadent spa. Barony Castle has the definite ‘wow’ factor you want in a wedding venue – an imposing driveway, heading up towards gleaming white towers and fluttering flags, past fields of adorable young alpacas! It makes a beautiful setting for an elegant country wedding for up to 110 guests during the day, and 130 for an evening reception. 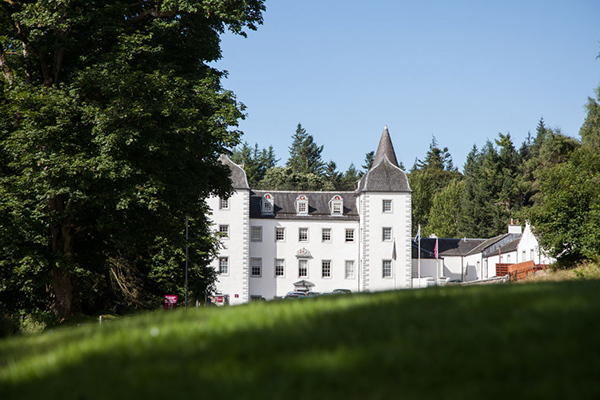 Barony Castle is a licensed wedding venue with several options for your marriage ceremony, including the Elibank and Meldons suites, the stunning courtyard or the 16th century stone altar. Your drinks reception can be held on the lawn, which is suitable for a marquee, or in the conservatory, and there are 25 acres of formal gardens and woodland, giving you glorious settings for photography. The boutique-style suites and bedrooms have elegant contemporary styling and some fantastic talking points, including the jacuzzi in the Dean View Suite, and the Tweeddale Suite with its sunken bath in the castle turret. Peebles is less than an hour’s drive south of Edinburgh on the River Tweed, and has some of Scotland’s best fishing, mountain biking and country walks right on the doorstep, making it a perfect weekend stop for your friends and family.